Jennifer Lawrence seems to have won Chris Martin back from Gwyneth Paltrow as the love triangle moves into its next stage of complex geometry. Jennifer Lawrence and Chris Martin have officially broken up, but we all know how many times Hollywood celebrities lie about their actual relationship status. Jennifer has been spotted at Chris’ Malibu home numerous times since their breakup as photos prove, and the pair was also spotted eating sushi at Studio City the other day. I highly doubt that Chris Martin and Jennifer Lawrence are having sushi as friends, and the only other alternative is that they are back together but trying to keep their dating on the sly. Jennifer is notoriously wary of the paparazzi and media, and their ‘breakup’ might have just been an attempt to throw the media and paparazzi off their trail. 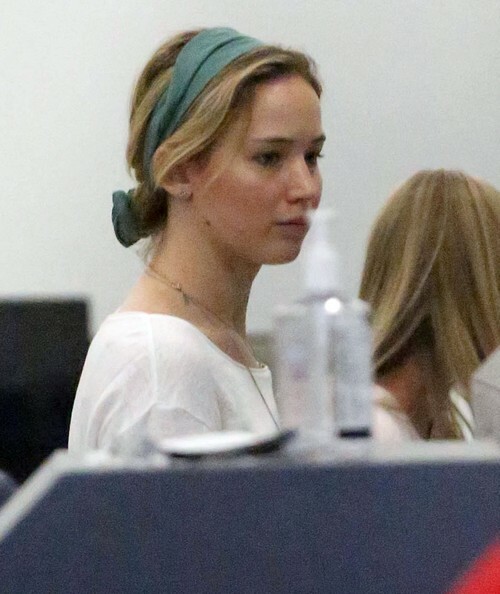 After all, it worked for Jennifer’s relationship with Nicholas Hoult, so why not with Chris Martin? The other issue in Jennifer’s and Chris’ relationship dynamic is Gwyneth Paltrow, and Chris Martin’s on-again/off-again relationship with her. We’d heard that even after Gwyneth Paltrow’s divorce and subsequent relationship rebound, Chris and Gwyneth stayed in touch and continued hooking up. Plus, Gwyneth has tried very hard to mark her property by arranging paparazzi videos to capture ‘candid’ moments with her and Chris, and the two have stayed remarkably close even after their breakup. In fact, one of the reasons that Jennifer reportedly broke up with Chris in the first place was because she was uncomfortable with his relationship dynamic with his ex-wife, and she didn’t want to get further involved if there was a chance that their family could be reunited. But whatever the reasons, Jennifer and Chris are clearly still dating, and if the rumors are accurate, getting more serious than ever. What do you guys think? Could Chris Martin and Jennifer Lawrence actually continue dating in the long run? Or will they inevitably breakup, leaving the road paved for a Chris Martin/Gwyneth Paltrow reunion? Let us know your thoughts in the comments below.